You are still running dscacheutil -flushcache after you edit your /etc/hosts file right? Ah! I forgot, yes, I did do that, though I forgot to add that in the post. your conclusion about “terminal and some of the BSD Unix tools” is wrong. you only used ping. now ping is an ipv4-only tool, use ping6 to ping v6 hosts. what you can do for testing is using telnet. use telnet -4 or -6 as option if you want to enforce ip 4 or 6 usage. Why do you need multiple names per line? I usually make a separate line for each name. I haven’t experienced any of these issues since upgrading to Lion. My scutil output is similar to yours and I’ve had none of the other issues. In my /etc/hosts file, I have several lines of 127.0.0.1, each with multiple entries and all my local hosts work fine. I’m using Macports for php and apache, though I doubt that would make a difference. Thanks for the comments & corrections everyone. The biggest problems that I could replicate consistently were first: the non-standard TLDs (.local, .dev). I think that was because with the real TLDs, the DNS servers would come back quickly saying the domain did not exist, and then it would hit the hosts file. But with the non-standard TLDs, it would have to timeout before hitting the hosts file. Second: not being able to use my /etc/hosts to overwrite normal DNS lookups. For example, if I want to skip my load balancer and test against a specific server behind the load balancer, I would edit my /etc/hosts file. But with Lion using the DNS Servers before the /etc/hosts, that trick doesn’t work, and I use it often. Using dnsmasq, it works like before. Justin, great post on the whole issue. I had just found some other post on dnsmasq right before seeing this. Your post handles it much more comprehensively. Thanks for discovering that .local is reserved. I was using it, but with mixed results in Lion. Sounds like switching away from it will be helpful. Thank you for taking the time to write all of this up. I just added a new domain to my hosts file and was wondering why it wasn’t resolving to the IP that I specified. Your analysis makes sense and I’m going to try your suggestion about DNSmasq. Hey Apple – please restore the original behavior of /etc/hosts! Just a follow-up. 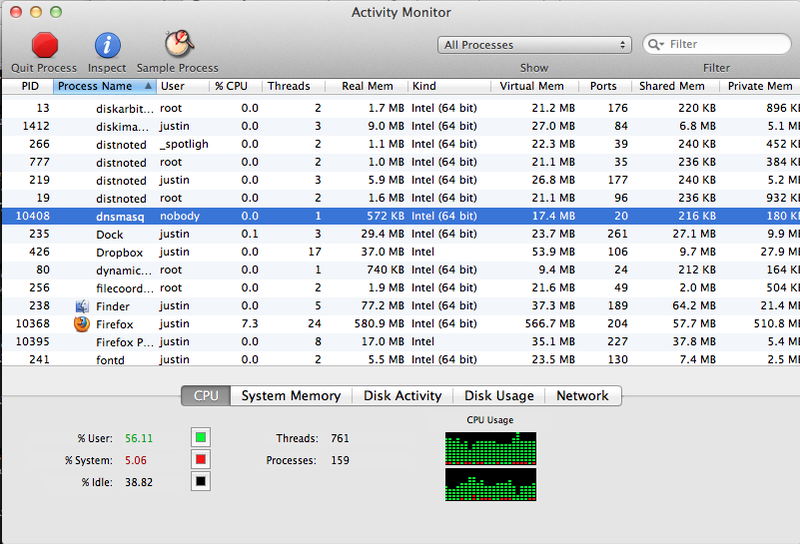 Lion was indeed supporting multiple hostnames per line in /etc/hosts, for me at least. Nevertheless, I have DNSmasq installed and all seems to be working well. I can confirm the same issue happens on SSH, each time when I ssh to a host with a shortcut in /etc/hosts, it takes 5 seconds or so to connect, while using IP only takes like 1 second. Just a massive thank you for this. I’ve been pulling apart apache, mysql… nightmare! Changing to .dev has fixed thing for me, big thanks to you! Instead of using /etc/hosts, you can use the dscl command to manage your hosts on Mac OS X (example, http://tomafro.net/2009/07/dscl-the-easy-way-to-add-hosts-on-osx). More simple, just install the ruby gem named “ghost” (https://github.com/bjeanes/ghost). 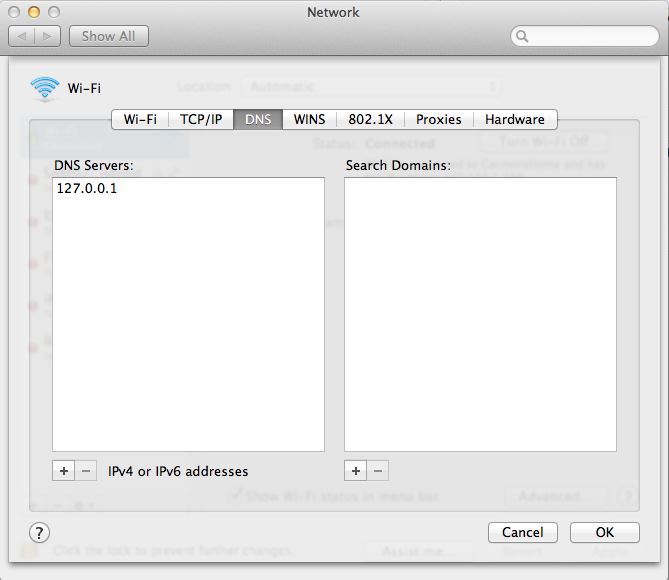 I’m able to use local address and override dns via host file in lion. i have my local addresses above fe80::1%lo0 and my overrides after it. seems to be working fine for me. For what it’s worth, I just tested this by pointing amazon.com to one of my own servers using /etc/hosts, and it worked just fine. Visiting amazon.com in Chrome, Safari, and Firefox worked as expected. Things like ping and telnet also worked as expected. Because of this, I suspect the issue has nothing to do with the order of DNS resolvers (by the way, you’re missing a character; it’s scutil –dns). I’ve tried Anonymous’s solution and it works just fine. Just stumbled upon the same problem here. Turns out it is because I was using a symlink to my hosts file that I keep in a Git repo. I can confirm both Anonymous and Nedios suggestions. I’m testing Active Directory integration, and had trouble accessing network accounts in a .local domain after binding and a subsequent reboot. The .local server worked ok after I put in an entry for it in /etc/hosts with an additivitet line for the IPv6 loopback for the same server. After a reboot, that is. When I tried commenting out the IPv6 loopback, the server wasn’t working anymore, and the connection was OK with the loopback entry activated again. (with reboots in between). Hope this is fixed in 10.7.2, I’ll be testing with the beta. Maybe worth an update to the article? I’ve updated the post, thanks for all the suggestions guys! Having the IPv4 entries BEFORE the IPv6 entries made it work for me. no need to install anything, just switching some lines to the beginning of the file. The multiple-entries-per-line in /etc/hosts was my issue. Although I was unable to ping localhost, browsers would resolve it in about 5.01 seconds. I never thought to change the format of my hosts file. I too was banging my head to get this resolved. AND I found a MUCH better solution. Host Name and IP address. I recommend when others google this problem that you add a note about charles in there. I can’t manage http://first.localhost/ to work. http://second.localhost/ works but http://first.localhost/ doesn’t work. If I delete the last two lines (which corresponds to SECOND) than http://first.localhost/ works. How can I add more than one local site in my hosts file? Btw I’m using Lion 10.7.2 which I upgraded today and all those problems arose after that upgrade. Ghost (or using dscl) does not help when in this situation. All of my DNS entries were made using ghost and I am still having the same issue as the author. Well, I used the solution provided by FabD (dscl command) and my life was happy and fabulous for some weeks. The resolution of local domains was absolutely immediate. Until today, that I updated to 10.7.2. All of the sudden, all local domains are unreachable, even ping fails miserably (something like “cannot resolve testdomain.dev: Unknown host”). I tried deleting and re-adding the domains, even installed the ghost gem, with no luck. Any help or advice? Thank you, Justin. I’ve spent a week trying to restore my local environment after 10.7.2 update. And finally I’ve found a solution. You and DNSMasq saved my mind. Thanks again. Thanks for a very thorough examination and a lot of detective work. This was linked on the Apache Friends Forum and hopefully other developers will find it. What WAS on Apple’s mind anyway??? /g'” 3=”/etc/hosts” language=”-pi~”][/perl] and everything started to work again. Thanks a lot for this detailed tutorial. It really did put me on the track. The workaround (which worked for me, after hours of googling) is to add a key/value pair to ‘com.apple.mDNSResponder.plist’ (StrictUnicastOrdering bool true) to MAKE the bloody MDNSResponder actually check 127.0.0.1 first. I’m not a DNS pro, so please feel free to correct any approximations I could have made in this answer ! I was experiencing the same issues as discussed. I managed to work with AppleCare by some stroke of luck, and the Apple engineers determined that my hosts file was corrupted–although the file did not appear corrupted as I was able to cat, less, and otherwise edit the file. Upon deleting and putting a new hosts file in place, everything started working as expected once again. I suspect the upgrade from Snow Leopard to Lion caused the file corruption, but I have no concrete evidence of same. I can confirm Roberts response, I was experiencing the same issue as the author, am using an SL to Lion upgraded iMac, and showed the same order of services in scutil. The only thing I needed to do to fix the issue was to cat /etc/hosts, copy it into my paste buffer, delete and recreate the file (from the paste buffer), save it, and run dscacheutil -flushcache. Lion now respects my hosts file entries. I DID NOT have to change my plist. I had the same problem with lines ending by CR/LF (Windows style). I saved the file with a LF line ending (Unix / OS X style) and that solved the problem. so this is a holdover from Snow Leopard if I understand the above; not sure i do. The problem for me was actually the encoding of the host files that Gas Mask was saving. I was having the issue where no matter what I put in the file via the Gas Mask editor, nothing changed. It turned out that the hosts file that was being saved was Unicode (UTF 8). When I re-encoded in TextWrangler to Western (Mac OS Roman), it worked just fine. Perhaps Gas Mask could be changed to write files in Western instead of Unicode. I’m essentially having the reverse problem. I run DNS servers that provide lookups for .local addresses. the idea is to have the response be the “closest” address. so at home, lookups for $homeserver are returned on $home-lan (192.168.1.0/24) but lookups for my shell server are returned on $vpn-lan. the problem is my laptop can be both. if I use /etc/hosts, all traffic for $homeserver is routed over the VPN all the time, even when I’m plugged into the same switch. this results in a huge performance drop! my goal is to have DNSmasq (or resolv.conf) queried first and then fall back to /etc/hosts, but this doesnt seem to be the case. Made leap from linux to mac dev environment and never would have thought using .local would bring my dev work to a painful snail’s pace 😦 Actually started dreading hitting refresh on my browser to check my code changes. host, dig, and nslookup all work, but ssh, ping, ftp etc fail name lookups. Your final update about the line endings on the hosts file helped me. I wonder what could have changed it. I have been using Lion for a while then suddenly it changed sometime after I connected to my school’s WPA2 Enterprise network. Breaking the hosts file broke my localhost hostname which broke my ability to debug Java in Eclipse with messages like “Invalid memory access of location 0x14 rip=” + some pointer. Thanks for the help. I want DNSMasq to send requests up stream based on my resolve.conf file. This is because I work from several different locations and need to use different dns servers depending upon which location i’m at. my machine looks at the hosts file but devices on sharing are hitting Dnsmasq.